The Riverside Community Health Foundation (RCHF) is the lead agency of the Riverside Community Diabetes Collaborative (RCDC). 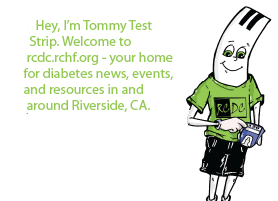 RCDC is a group of over 40 diabetes-focused organizations and businesses that work together to strengthen community programs and services for the prevention and management of diabetes in Riverside and surrounding areas. RCDC is your local resource for diabetes and chronic disease prevention information, events and more. If you are a health professional interested in being involved with RCDC please contact Samuel Anaya at (951) 788-3471. RCDC provides FREE health education classes to prevention chronic conditions. If you or a loved one has diabetes and are looking for tips to better management the condition join the “Together We Can! Diabetes Wellness Program! The program includes FREE monthly diabetes cooking classes, diabetes social support, quarterly mini-series and an annual seminar! For more information and a schedule of classes please visit our calendar page. Our Mission: To strengthen community programs and services for the prevention and management of diabetes in Riverside. The efforts of the Riverside Community Diabetes Collaborative (RCDC) are rooted in a diverse group of dedicated individuals, offering a broad spectrum of expertise from a multitude of agencies. Their work is infused with the desire to work together towards a community solution for diabetes. By rallying in a united effort, RCDC seeks to impact the prevention and treatment of diabetes. RCDC represents a golden opportunity to connect Riverside residents with their much needed resources by addressing access barriers to health services, such as cultural or language gaps, transportation or lack of insurance. The strength of the collaborative lies in that “No one agency is going to accomplish this task alone. The collaborative allows for agencies to work together and make connections that may not otherwise happen.”Another collaborative member states the importance of the work of this group, “We are a group that is striving to really make an impact in our Riverside community. We are taking action and not just having conversations amongst ourselves.”Diabetes is a chronic disease that has reached epidemic levels across our nation. Two out of three people with diabetes die of heart disease or stroke. Diabetes is the #1 cause of adult blindness and kidney failure, and it causes more than 60% of non-traumatic lower-limb amputations each year. More children are being diagnosed with Type 2 diabetes every year, which has severe implications for both their quality of life as well as their projected length of life. Riverside County has before ranked 22 out of 58 counties in the US with regard to diabetes. Even more startling: one third of those suffering from it don’t even know they have it! Currently, RCDC is focusing on creating the awareness and understanding of diabetes, and helping individuals make and sustain healthy behavior change. By doing this, we seek to prevent or delay the onset of diabetes for many, increasing self-management skills and the access to resources. RCDC is providing access to self management classes through the Diabetes Conversation Map sessions offered in Spanish and English at no cost. It’s our hope to significantly reduce the impact of diabetes and its related complications.